Did I mention the ditch? Crompton, left, Gillis and Conforti the morning after the raid. The arriving agents were met at the airstrip by Henry Voss, Nan Wanatka's brother-in-law, who was also in on the plan. 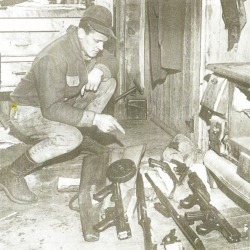 Not knowing of the gang's change in its plans, everyone assumed there was enough time to organize the raid, and an agent was assigned to go with Voss to his lodge, just under two miles from Little Bohemia, set up a command post, and await the arrival of the other agents, who first needed to rent cars. Since Wanatka's plan was to herd all the innocent people into Little Bohemia's basement at 4 a.m., Clegg decided that's when the raid would occur. He calculated agents would be in place around the lodge by then, and road blocks would have been set to corner the odd gang member that might escape. Before the agents had even unloaded weapons, teargas and bulletproof vests from the planes however, Voss was back at the airstrip to report he had just met his wife on the road. She was headed to the airstrip to alert the agents of the gangs' change in plans. They would likely be leaving within two or three hours. It was nearly 6:30 and Clegg knew even if he left immediately, he couldn't get to the lodge until at 8 p.m.
Cars were located as quickly as possible, and the agents gathered in a garage for a quick attack plan based on a sketchy map of Little Bohemia drawn by Voss. It was agreed three agents would storm the main door of the lodge, and two groups of five each would form a line on either side of the lodge to prevent anyone from leaving in those directions. The remaining agents would spread out and help as needed. The gang, they believed, would be trapped on all three sides. They weren't concerned about the rear of the lodge because Voss told them there was a lake there, and there were no boats in the water at that time of year. He neglected to tell the agents that the shoreline was protected by trees and a steep embankment. Voss' map also failed to note there was a deep ditch on the left side of the lodge, and barbed-wire fencing on the right side. He also forgot to tell them about the two watchdogs. At 7:15 p.m., five cars of agents left for Little Bohemia. The road was muddy and pot-holed, and within 30 miles two of the cars had broken down. The eight agents in those cars were forced to stand on the runningboards of the remaining three cars in the cold spring air as the cars sped toward Little Bohemia. Back at the lodge, Mrs. Wanatka was told by her sister, Mary Voss, who had by now returned to the lodge, to "Just get in your car and leave." Since the gang itself was packed and ready, they had no objection to Mrs. Wanatka going to her sister's house. As she exited the lodge's grounds and turned right into Highway 51 toward her sister's house, Pat Reilly and Pat Cherrington were approaching from the opposition direction and unknowingly passed her on the road. As Reilly approached the lodge, he again didn't like what he saw, and decided not to go into the driveway. Instead, he drove past for a distance, then pulled over and parked. When the agents arrived at Voss' Birchwood Lodge, they were told by Mrs. Wanatka that the gang was still at Little Bohemia awaiting Reilly's arrival. Clegg knew it was now or never, and decided to storm the lodge immediately. They drove the mile and a half to the lodge without headlights, and left their cars parked along Highway 51. The agents fanned out, five to each side and Clegg, Purvis and the others toward the front. There was no time to alert local authorities, or to establish road blocks. All of the nearly 20 agents were at the lodge, and there was no back-up. The agents quietly made their way through the dense trees leading to the lodge, but just as they got in sight of the lodge's lights, Wanatka's dogs, Shadow and Princess, began barking wildly. Assuming they had lost the element of surprise, they began running toward their assigned positions around the lodge. Inside, however, the dogs were hardly noticed. Several members of the gang were playing cards at the bar, and never looked up, Wanatka would later say. The dogs were always barking at something, and the gang no longer even noticed the noise. At the same time, the last three customers, a gas salesman from nearby Mercer, and two men from the area CCC camp, had paid their tab and walked out the front entrance. With the dogs still barking, lodge employees Bazso and Traube decided to see what the commotion was, and walked out onto the kitchen porch, several feet from the main entrance. What the agents saw were five men (the same number as in the gang) exiting the lodge from two doors. Several agents called out that they were federal officers and ordered everyone to halt, but the three men were already in their car. The salesman, John Hoffman, in starting the engine also started the radio and the three could not hear the agents repeated commands to stop, nor could the two employees hear the commands over the car's blaring radio and barking dogs. As the car began to move, Clegg and Purvis assumed the gang was trying to escape and ordered the tires shot out. Gunfire erupted, and the car seemed to explode as windows shattered, tires popped and the car rocked with bullets hitting it. John Morris, an elderly cook at the CCC camp fell out the right side door with four bullets in him, but managed to stumble to the kitchen door. Hoffman, also wounded, jumped from the car and crawled into the woods. Eugene Boisneau, a young CCC camp worker, remained seated in the center of the front seat. He was dead. The shooting from the lodge only lasted a minute or two. Dillinger, Hamilton and Van Meter had already jumped from a rear window into snow piled against the back of the lodge, slid down the embankment to the lake and, turning right, escaped along the shore. Carroll followed a moment later, as did Nelson, but he turned left at the shore and escaped in the opposite direction from the others. Meanwhile, the agents were in trouble in the darkness. The group on the left had stumbled into the drainage ditch while the group on the right was hopelessly tangled in the barbed-wire fence. Purvis and the others storming the front, however, continued to fire a steady volley into the lodge, unaware the gang was gone, or that the agents on either side were in trouble. As all of this was happening, Reilly and Cherrington, still parked down the road, finally decided to go back to the lodge. They had just pulled into the driveway when they heard the gunfire and saw several armed men running toward them. They ordered Reilly out of the car, but he rammed the car into reverse and started to back out toward Highway 51. Agents opened fire and the window near Cherrington shattered, covering her in glass. A tired exploded and the car began to lurch wildly, but Reilly managed to back out onto the highway. He slammed on his brakes and with grinding gears shifted into first. For a brief moment, the car sat motionless on the roadway, and then it suddenly shot forward, it's shredded tire thumping loudly as it zig-zagged along the road and disappeared into the darkness. The agents ran back up the road toward the lodge where Purvis and the others were maintaining a steady stream of gunfire into the building. Inside, Wanatka, Traube, Bazso, and the three gang girls, had made their way to the cellar. 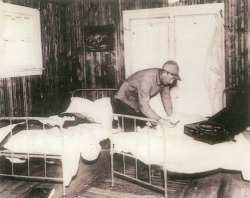 Upstairs, Morris, the wounded CCC cook had managed to crawl into the kitchen and unhook the telephone. "Alvin, we're at Emil's. Everybody has been knocked out." He was talking to Alvin Koerner, who ran the local telephone exchange. Wanatka, who heard Morris screaming into the phone, ran upstairs. He grabbed the phone and was soon connected with the police, who told Wanatka to put on the lights and go outside with his hands up. The three women refused to leave, but Wanatka, his two employees and Morris exited, all with their hands up. Clegg, still thinking the gang was inside, ordered everyone to stop shooting. He was giving them time to surrender before he would begin lobbing teargas into the building. When no one else came out, the shooting resumed and the teargas started. About a mile away, Van Meter, Hamilton and Dillinger emerged from the woods and ran toward a large farmhouse. Inside were Mr. and Mrs. E.J. Mitchell, an elderly couple. When they answered the knock on their door, the three men stepped inside. Hamilton asked for a drink of water and then walked across the room and pulled the phone wire from the wall. Seeing the terrified look on the elderly woman's face, Dillinger said, "You've probably heard stories about me, but I'm not as bad as I'm pictured." "You couldn't be Dillinger?" she asked. "You couldn't have guessed better," he said. He assured them they meant no harm, and that they only needed transportation. When the gang ordered everyone outside, Mitchell noted "My wife is just getting over the flu." Dillinger got a blanket and draped it over her shoulders, saying, "Here you are, mother." Unable to get Mitchell's old truck started, Van Meter pointed to a Ford coupe parked in front of a cottage next door. Dillinger shouted at the house that Mrs. Mitchell was ill, and they needed a ride to the doctor. When the neighbor came out, they forced him into the car and told him to drive them to St. Paul. The Mitchells were allowed to return to their home. The couple later testified that the gang had been calm, polite and respectful, except for Hamilton pulling the phone wire from the wall. Just as the gang was driving off, Carroll also emerged onto the highway and began walking north in search of a car. He walked to the village of Manitowish Waters, about a mile from Little Bohemia, where he managed to steal a Packard outside the Northern Lights Resort. He hoped to drive to Mercer, but took a wrong turn at a fork in the road. It would take him several hours to discover he was on a dead-end logging road. A map of the gang's escape routes from the lodge.